The recent mass shooting in Las Vegas that left dozens of people dead and hundreds injured raises two important questions: How do dangerous people get their guns? And what should the police and courts be doing to make those transactions more difficult? The fact is that, even leaving aside the assault in Las Vegas and terrorist attacks like the one in San Bernardino, California, in 2015, gun violence is becoming almost routine in many American neighborhoods. The U.S. homicide rate increased more than 20 percent from 2014 to 2016, while last year’s 3.4 percent rise in the violent crime rate was the largest single-year gain in 25 years. The guns carried and misused by youths, gang members and active criminals are more likely than not obtained by transactions that violate federal or state law. And, as I’ve learned from my decades of researching the topic, it is rare for the people who provide these guns to the eventual shooters to face any legal consequences. How can this illicit market be policed more effectively? 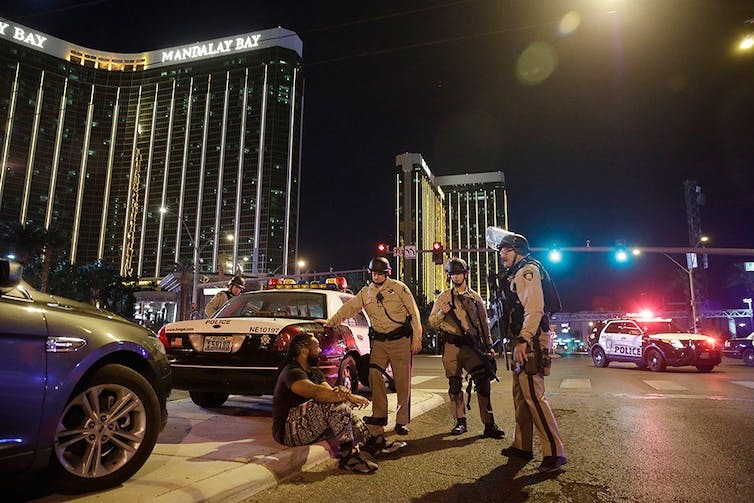 Police officers stand at the scene of a shooting near the Mandalay Bay resort and casino on the Las Vegas Strip. The vast majority of gun owners say they obtained their weapons in transactions that are documented and for the most part legal. When asked where and how they acquired their most recent firearm, about 64 percent of a cross-section of American gun owners reported buying it from a gun store, where the clerk would have conducted a background check and documented the transfer in a permanent record required by federal law. Another 14 percent were transferred in some other way but still involved a background check. The remaining 22 percent said they got their guns without a background check. The same is not true for criminals, however, most of whom obtain their guns illegally. A transaction can be illegal for several reasons, but of particular interest are transactions that involve disqualified individuals – those banned from purchase or possession due to criminal record, age, adjudicated mental illness, illegal alien status or some other reason. Convicted felons, teenagers and other people who are legally barred from possession would ordinarily be blocked from purchasing a gun from a gun store because they would fail the background check or lack the permit or license required by some states. Anyone providing the gun in such transactions would be culpable if he or she had reason to know that the buyer was disqualified, was acting as a straw purchaser or if had violated state regulations pertaining to such private transactions. The importance of the informal (undocumented) market in supplying criminals is suggested by the results of inmate surveys and data gleaned from guns confiscated by the police. A national survey of inmates of state prisons found that just 10 percent of youthful (age 18-40) male respondents who admitted to having a gun at the time of their arrest had obtained it from a gun store. The other 90 percent obtained them through a variety of off-the-book means: for example, as gifts or sharing arrangements with fellow gang members. Similarly, an ongoing study of how Chicago gang members get their guns has found that only a trivial percentage obtained them by direct purchase from a store. To the extent that gun dealers are implicated in supplying dangerous people, it is more so by accommodating straw purchasers and traffickers than in selling directly to customers they know to be disqualified. 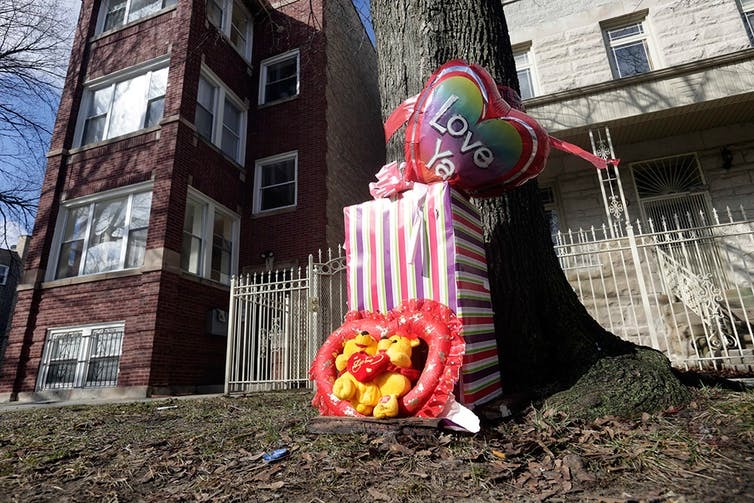 A makeshift memorial in Chicago lies at the site where a baby girl, her mother and her father – a known gang member – were shot in 2013. Most Chicago gang members appear to get their guns secondhand. While criminals typically do not buy their guns at a store, all but a tiny fraction of those in circulation in the United States are first sold at retail by a gun dealer – including the guns that eventually end up in the hands of criminals. That first retail sale was most likely legal, in that the clerk followed federal and state requirements for documentation, a background check and record-keeping. While there are scofflaw dealers who sometimes make under-the-counter deals, that is by no means the norm. If a gun ends up in criminal use, it is usually after several more transactions. The average age of guns taken from Chicago gangs is over 11 years. The gun at that point has been diverted from legal commerce. In this respect, the supply chain for guns is similar to that for other products that have a large legal market but are subject to diversion. In the case of guns, diversion from licit possession and exchange can occur in a variety of ways: theft, purchase at a gun show by an interstate trafficker, private sales where no questions are asked, straw purchases by girlfriends and so forth. What appears to be true is that there are few big operators in this domain. The typical trafficker or underground broker is not making a living that way but rather just making a few dollars on the side. The supply chain for guns used in crime bears little relationship to the supply chain for heroin or cocaine and is much more akin to that for cigarettes and beer that are diverted to underage teenagers. There have been few attempts to estimate the scope or scale of the underground market, in part because it is not at all clear what types of transactions should be included. But for the sake of having some order-of-magnitude estimate, suppose we just focus on the number of transactions each year that supply the guns actually used in robbery or assault. There are about 500,000 violent crimes committed with a gun each year. If the average number of times that an offender commits a robbery or assault with a particular gun is twice, then (assuming patterns of criminal gun use remain constant) the total number of transactions of concern is 250,000 per year. Actually, no one knows the average number of times a specific gun is used by an offender who uses it at least once. If it is more than twice, then there are even fewer relevant transactions. That compares with total sales volume by licensed dealers, which is upwards of 20 million per year. So how do gang members, violent criminals, underage youths and other dangerous people get their guns? A consistent answer emerges from the inmate surveys and from ethnographic studies. Whether guns that end up being used in crime are purchased, swapped, borrowed, shared or stolen, the most likely source is someone known to the offender, an acquaintance or family member. For example, Syed Rizwan Farook – one of the shooters in San Bernardino – relied on a friend to get several of the rifles and pistols he used because Farook doubted that he could pass a background check. That a friend and neighbor was the source is quite typical, despite the unique circumstances otherwise. Also important are “street” sources, such as gang members and drug dealers, which may also entail a prior relationship. Thus, social networks play an important role in facilitating transactions, and an individual (such as a gang member) who tends to hang out with people who have guns will find it relatively easy to obtain one. Effective policing of the underground gun market could help to separate guns from everyday violent crime. Currently it is rare for those who provide guns to offenders to face any legal consequences, and changing that situation will require additional resources to penetrate the social networks of gun offenders. Needless to say, that effort is not cheap or easy and requires that both the police and the courts have the necessary authority and give this sort of gun enforcement high priority. This is an updated version of an article originally published on Jan. 15, 2016.